Amazon Pay provides Amazon customers a secure, trusted, and convenient way to sign in and pay for their purchases on your site. Customers use Login with Amazon to share their profile information (name, email address, and zip code) and get access to their shipping address and payment method stored in their Amazon account to complete their purchase. This guide provides details on enabling automatic payments for subscriptions or other regular payments scenarios by using the API-based integration called Amazon Pay and Login with Amazon, which provides a greater degree of flexibility and customization to meet your payment needs. With the automatic payments feature, customers can pre-authorize payments for future purchases. This enables you to charge a customer's Amazon account on a regular basis for subscriptions and usage-based billing without requiring the customer to authorize a payment each time. Note: The Amazon Pay service has been designed and developed for use within a web browser only. Our service cannot be used within a native application (including, without limitation, iOS, Android, RIM, and Windows operating systems). Amazon Pay reserves the right to suspend the payment account of any user of our services that has implemented our service within a native application. Previous experience using web service. The ability to handle asynchronous processing of payments. For more information, see Synchronizing your systems with Amazon Pay. A Seller ID (also called a Merchant ID) for an Amazon Pay Seller. The Amazon Pay Seller account must have the Amazon Pay and Login with Amazon service provisioned. You can create an Amazon Pay Seller account or provision an existing Seller account for Amazon Pay and Login with Amazon by signing up for Amazon Pay from the Amazon Pay website. Access to your Amazon Marketplace Web Service (Amazon MWS) Access Key and Secret Key. To get these keys, register with Amazon MWS, or authorize a developer to make calls on your behalf. For more information, see Registering to use Amazon MWS in the Amazon MWS Developer Guide. Register your website as an application on the Login with Amazon App Console. For more information, see the Login with Amazon Getting Started Guide. Registering your website sets a client identifier (Client ID), which you will need for your integration. Amazon Pay and Login with Amazon are embedded directly into your existing website, and all of the customer interactions with Amazon Pay and Login with Amazon take place in embedded widgets, so the customer never leaves your site. Login with Amazon lets your customers become registered users just by signing in with their Amazon login credentials. Amazon Pay then transfers user information to you that lets you create a local account for the customers. Users that register this way are your customers, and you get the real customer email address and can contact them directly. Amazon Pay represents a checkout that is fully integrated into your site by means of widgets that Amazon Pay provides to you. In this Amazon checkout, which is part of your website, the customer chooses a shipping address and payment method they already have stored in their Amazon user accounts. Regardless of whether or not the customer previously used Login with Amazon, you can offer Amazon Pay as a guest checkout, a registered checkout with implicit account creation, or both. In the latter case, you leave the choice to the customer. Using Amazon Pay and Login with Amazon, your customers can become registered users and check out with a few clicks, saving them from entering a lot of information. The end-to-end Amazon Pay and Login with Amazon experience is designed to make checkout for one-time or automatic purchases easy and secure for customers and payment processing easy and secure for you. Before you start the integration, you should familiarize yourself with a few key concepts regarding this service. Use this button to let customers sign in to your site and pay using their Amazon accounts. Customers can sign in before, during, or after they begin the checkout process. Customers can share with you their profile information (name, email address, and postal code) and access the shipping and payment information stored in their Amazon accounts to complete their purchases on your site. You receive information from the customer’s Amazon profile, including their name and email address. You can use this information to customize the customer’s shopping experience and track their browsing history. The customer can use the payment widgets on your site to access the shipping and payment information stored in their Amazon account for a period of 55 minutes after they sign in. After 55 minutes, the authentication token expires and you need to ask them to sign in again. When the customer chooses a shipping address, you have access to the full shipping address as soon as they click it. The customer wants to check their purchase history or sign up for special deals on your site. For a period of 55 minutes after they sign in, customers can buy any product in just two clicks with their shipping and payment information stored at Amazon Pay. The customer clicks the checkout button, authenticates using Login with Amazon during the checkout process, and then accesses the shipping and payment information stored in their Amazon account to complete the checkout process in only two clicks. You want to give the customer the option to register with your site at the end of the checkout process so that they can access their order history and track their items on your site. The customer wants to go to their account settings and update the shipping or payment information associated with a previous order. To do so, the customer can use the Login with Amazon button to access the shipping or payment information stored in their Amazon account and update the information. The customer’s name, email address, and postal code. The customer's shipping addresses chosen before placing an order. If a customer decides not to share their information with you, the authentication token throws an error response message of access_denied. The customer isn't able to register on your site via Amazon Pay and Login with Amazon or access payment and shipping information from their Amazon account. Of course, the customer can go through your seller's standard account registration process. Use this button to let customers sign in to your site and pay using their Amazon credentials while sharing their profile information and full shipping address with you before completing a transaction. The customer can use the payment widgets on your site to access the shipping and payment information stored in their Amazon account for a period of 60 minutes after they sign in. After 60 minutes, the authentication token expires and you need to ask them to sign in again. The customer wants to initiate a payment process from the cart page and access the shipping and payment information stored in their Amazon account. The customer wants to set up their payment and shipping preferences for automatic payments with the shipping and payment information stored in their Amazon account. You need access to the full shipping address for fulfillment or tax calculations before completing a transaction. An access token is granted by the authorization server when a user signs in to a site. An access token is specific to a client, a user, and an access scope. A client must use an access token to retrieve customer profile data and allow access to shipping and payment information. Billing Agreement object — This object is a record of the customer's preferred payment method, preferred shipping address, and authorization for an automatic payment. The customer determines some of these attributes as they go through the checkout process (for example, the shipping address and payment method), and you will set some of the attributes with information about the order and/or subscription. Order Reference object — This object is a record of each purchase made by the customer. For an automatic payment, this object is created when you process a payment for a particular automatic purchase. The payment method and shipping address (if specified) are derived from the Billing Agreement object. Authorization object — This object represents the availability of funds in the chosen payment method and reserves them for future collection using a Capture. 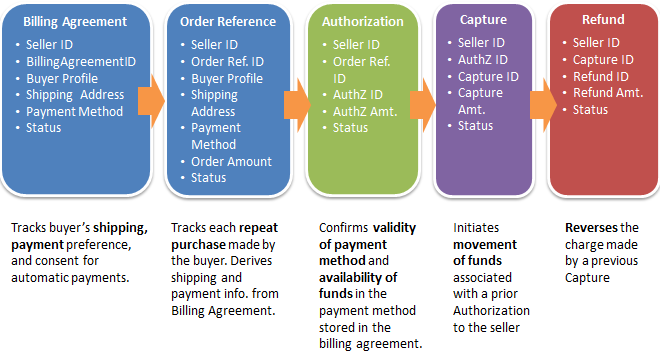 Capture object — This object represents the movement of funds from the customer’s payment method to your Amazon Pay Seller account. Refund object — In the event of a refund, this object represents the movement of previously captured funds back to the customer. Each of these objects is identified by a unique identifier, and each has a status. You will learn more about using these objects in the next chapter of this guide. Widgets are Amazon Pay-hosted controls that you can embed in your site. They enable the customer to sign in to your site, authenticate using their Amazon credentials, review the address and payment methods stored in their Amazon account, and choose those that they want to use for their purchases. The chosen address and payment method information is stored in the Billing Agreement object and copied to the Order Reference object. You call the operations in the Amazon Pay API section to exchange information and instructions between Amazon Pay and your internal systems. For example, you call these operations to obtain customer profile information, request Amazon Pay to charge the customer, issue a refund, get the customer's shipping information, or cancel a billing agreement. For more information, see the Amazon Pay API reference guide. Amazon Pay often processes your payment requests (Authorize, Capture, and Refund requests) in an asynchronous manner. After Amazon Pay processes the request, you receive a notification, called an Instant Payment Notification (IPN), which notifies you of the final status of the request. Additionally, the status of a payment object can change because of a request submitted by you or because of an internal Amazon Pay business rule. If the status of a payment object changes, Amazon Pay sends an IPN to you so that you can keep your system in sync with Amazon Pay. For more information, see Synchronizing your systems with Amazon Pay.